LG G3 the latest flagship smartphone by LG is a beast when it comes to specification. LG G3 is one of the few smartphones having Quad HD display 2560×1440 vs 1080p on the other smartphones. It has a 2.5 GHz Qualcomm snapdragon 801 processor and it turns on Android 4.4 KitKat. LG had made a lot of changes to their old user interface which we have seen earlier on the LG G2, and now the user interface has new flat style look to it. Many other software changes have been implemented in the G3. And one of the major change is the Smart Keyboard. 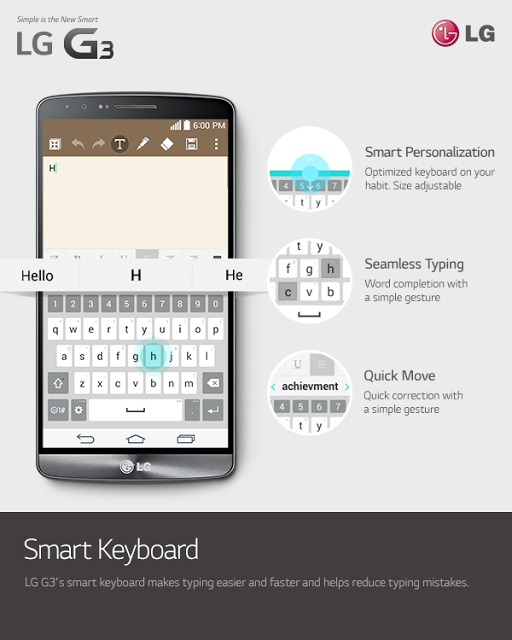 Smart Keyboard comes with Smart Personalization, Seamless type and Quick move like features. And once again the folks over at XDA Developers ported the LG G3 Smart Keyboard to all Rooted Android devices. 3. Go to Smart Keyboard, set it up as per your requirements, then select it as active. 4. It’s done now just use it. That’s it! All done! Smart Keyboard is now ready to use.